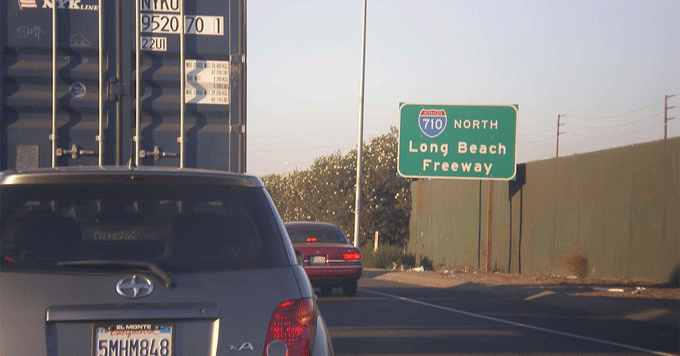 On the I-710 freeway in L.A., more and more diesel trucks carry goods from the city’s huge port to rail yards and warehouses. For decades, the city’s been considering a freeway expansion project to make room for even more traffic. But critics say that will lead to additional global warming pollution and increased health risks. Darryl Molina Sarmiento is executive director of Communities for a Better Environment. For years, the group has organized nearby communities to fight the expansion plans. Their persistence has made a difference. Last March, transit agencies indefinitely postponed the decision to add lanes to the highway. The project is not dead. But current plans focus instead on interchange upgrades, pedestrian crossings, and funding for low-emissions trucks.